In addition to supplying you with AdBlue in bulk, IBCs and packages, Greenox® provides you with a full range of high quality storage and dispensing equipment, suitable for every application and budget. 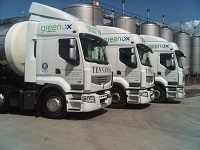 Greenox® is produced in the UK at chemical manufacturing sites owned by the Tennant Group; we believe that this offers the lowest cost logistical solution and smallest carbon footprint compared to shipping a product that is 67.5% water. High purity raw materials are sourced from leading producers and then used to produce our AdBlue® solution, which is independently analyzed to ensure that it meets the ISO22241 standard as required by your vehicle producer.